Today I would like to take you to the Soulless Necron home world to see how 5th edition line of sight rules have effected my terrain. I've noticed that there has been a lot of discussions going around regarding the true LOS rule recently, and most of it has been negative! 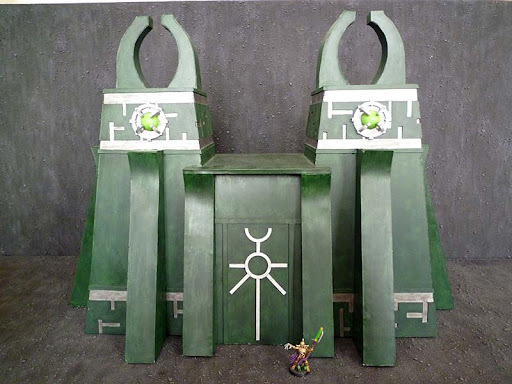 All of my Necron terrain was built around the time when 3rd edition was coming to an end, and 4th edition was just about to come out. In 4th edition everything was about sizes and I could really see the benefits. Everything became standardized and things like a size three model could gain a cover save from a size 2 barricade, but not a size 1 barricade, simple! Nowadays, with true LOS, what was then a size three monstrous creature, can only get coversaves if 50% in cover, leaving an opening for someone to dispute it. On a side note, why was there no size four in the old rules? 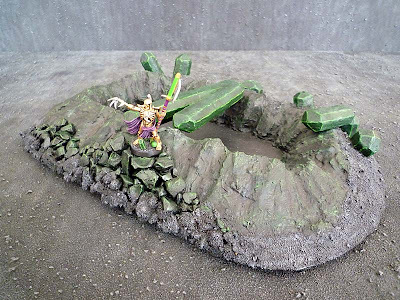 Surely a Monolith and some larger pieces of terrain could warrant an additional size. But that was then and this is now, and lets face it, both of these versions give us some problems and can slow the game down, but in my opinion, the true LOS rules win hands down. For me, getting down to see what my models can see to determine if they can shoot or get any saves really does bring me into the game more. Yes, I have had my fair share of annoying disagreements with certain players, but hey, just take a 5+ cover save instead, or roll for it if it's that bad! With everything else like the assaults being speeded up in 5th edition, the game is already a lot quicker anyway. LOS is pretty simple for my terrain in 5th edition now, as most of it is solid and you are either behind it or not. My latest army, The IDIC Eldar, is loving my Necron terrain as it's perfect for hiding a contesting tank or scoring jetbike squad behind it, but at the same time, it can mean that your shooting ability is reduced. 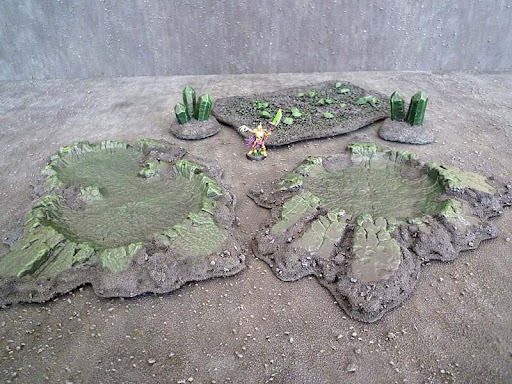 Most of my terrain is based on the Necron Codex. One reason why I fell in love with Necrons was because of the Codex pictures, and that's how I wanted my Necrons to look! 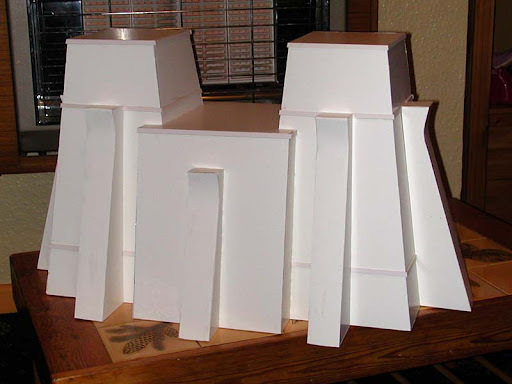 I made all of my tombs from foam board. If you have the ability to do so, an angled cutter can make it easier to join your edges together. All of the additional patterns and sticky out bits ware just peices of cut out cardboard stuck on to the surface. Back in the days when I made my tomb, you could buy separate sprues from GW and I purchased two Monolith sprues to get the two crystal sections at the top of the towers. Most of the other terrain was made from a base of foam/polystyrene and filled in with polyfiller. When it came time to paint it, I used a base coat of Choas Black, then Dark Angels Green with a dry brush of Snot green and Scorpion Green to finish. I have directed our Necron player to this post! Your Necron Tomb looks absolutely amazing. Well done. I am constantly amazed at what people can put together with foamcore board. Lovely. I like themed terrain, so much better than the 'random scramble' you so often see on the table. I would not have thought of drybrushing my craters and other ground terrain with green to give that unmistakable Necron look. Fantastic looking stuff! Best I could turn up was from two year's ago Astro... anyway it is nice, maybe you can dig up a full table picture there are Pyramids, and Pylons and columns etc. Impressive tomb and nice green effect. I would love to see a more 3/4 view, and/or maybe a how-to for you made those curved buttresses. 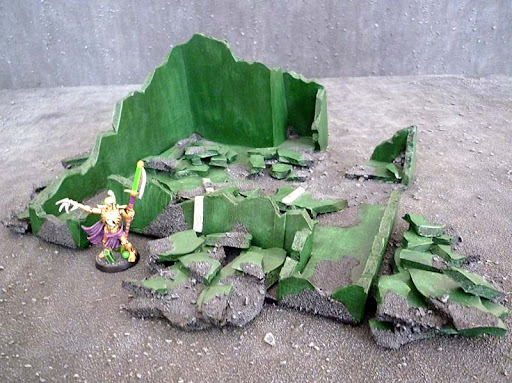 Some great terrain. I would love to see more of the temple - how you built it etc.